Channing Tatum has confirmed his Magic Mike Live London transfer from Las Vegas this November. Based on the Hollywood star's hit 2012 film Magic Mike, which stars Tatum and Matthew McConaughey, the stage adaptation will open at the Hippodrome Casino in Leicester Square from 28th November (following previews from 10th November) and is currently booking until 27th October 2019. This follows its Las Vegas opening a year ago. The live show opened in Vegas last year and sees audience members (aged 18 and up) enter Magic Mike's mythical nightclub, Club Domina, for a show that features strip and dance routines entwined with one-of-a-kind acts. 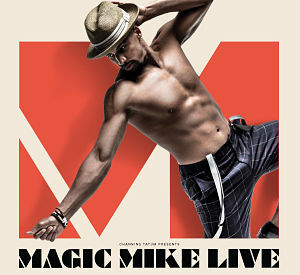 You can see the trailer for Magic Mike Live here. Magic Mike Live in London is co-directed by Channing Tatum and Alison Faulk, with Teresa Espinosa as associate director, and choreographed by Alison Faulk, The Executive Producer is Vincent Marini with General Management by David Ian Productions. The production designer is Rachel O'Toole, with scenic design by Rob Bissinger and Anita LaScala (Arda Studio), Costume Design by Marina Toybina, lighting design by Philip Gladwell and video design by Luke Halls. Musical supervisor is Jack Rayner, with sound design by Nick Kourtides. Dreya Weber is aerial choreographer & aerial apparatus designer. Production management is by Simon Gooding and Matt Jones and casting is by Jason Styres CSA. Buy tickets for Magic Mike Live which is currently booking until 5th January 2020.